When my friend Mitch texted me and asked what I was doing the next Saturday I knew what was on his mind. He wanted to visit a brewery, the only question was which one. 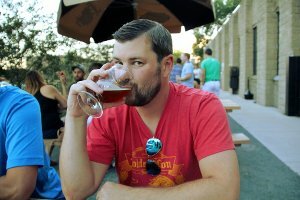 After he mentioned the Fargo-Moorhead area I knew what breweries he had in mind, and I knew that we would have to take full advantage of our time. At 8AM he arrived at my home in Bloomington and we began the long trek to Fargo Brewing Company the first stop of our jam-packed day trip. Our itinerary was built around the opening times of the breweries. Fargo Brewing won that lottery since they opened at noon. We arrived 6 minutes before. I often remark that if I had one super power it is getting somewhere on time. It’s not a great super power, but it’s what I have. Needless to say we were the first ones in the taproom and I think they were a little surprised to see us so early. 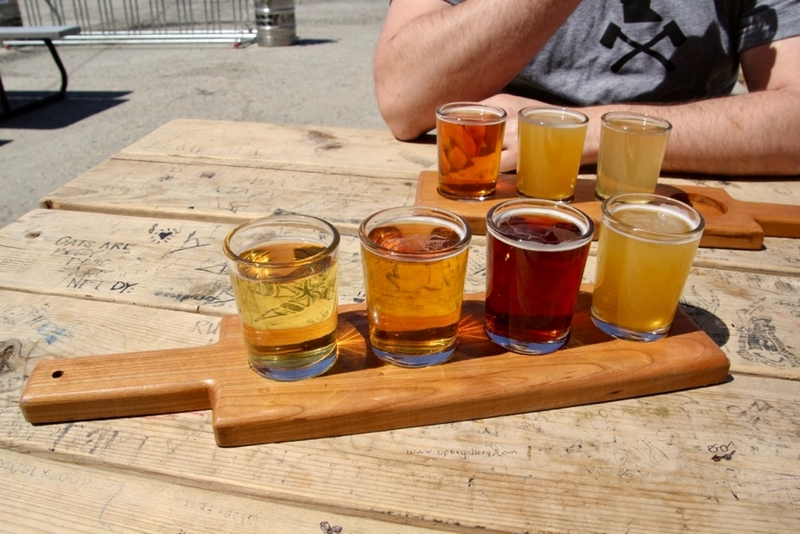 We each grabbed a flight of beer and took to their patio to relax after the long drive. 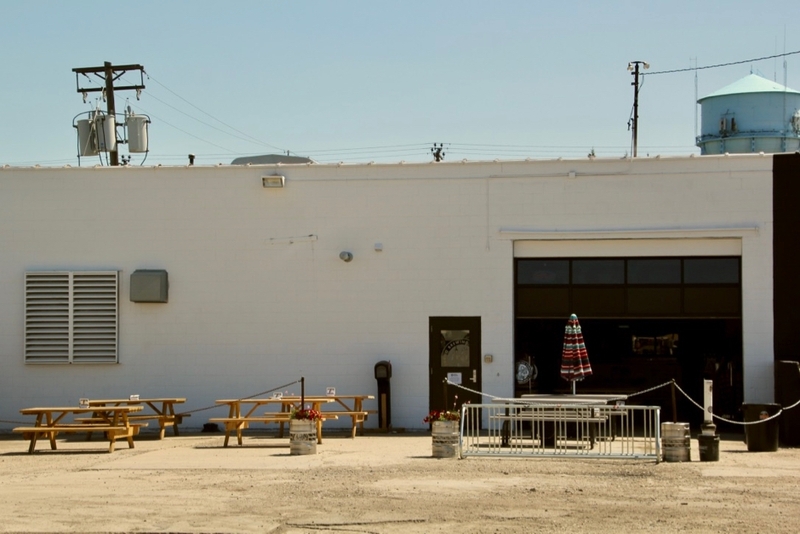 Fargo Brewing Company is located on the edge of a residential area alongside the railroad corridor. 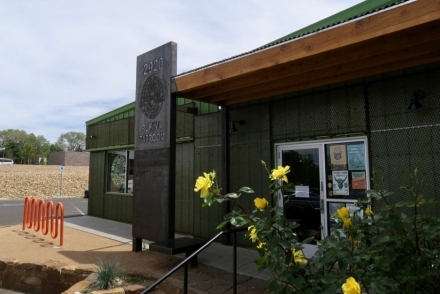 The patio is positioned on an apron outside their taproom bordering the gravel parking lot. It’s got a handful of picnic tables and we were bold enough to forego one with an umbrella. This is a decision that we’d later regret but for a moment we soaked in the sun. Not long after we started into our flights a train whistled past from behind the taproom and laid on its horn. It scared the crap out of us! Any brewery that gets regular visits from trains gets an instant rating boost for me. There is something about the raw power of a locomotive that excites me. Two thirds of the way through my flight the wind picked up considerably. We had just moved to the only table with an umbrella and it must have been fate. The umbrella caught a gust of wind and took to the air. We were just barely able to grab on and prevent it from flying off! 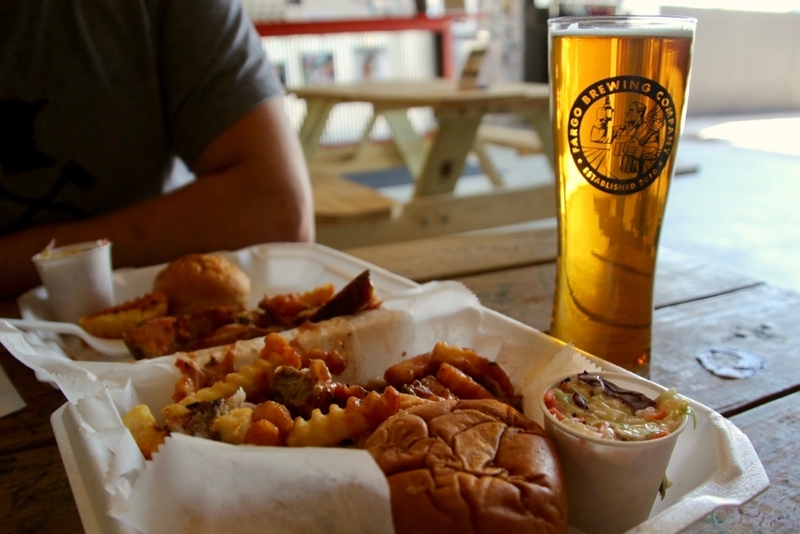 Our job now complete on the patio, we moved into the taproom for a pint of beer and an order of rib tips from Rib Supreme. Take a look at the photo of that meal, it might look a little sloppy but it was fantastic. 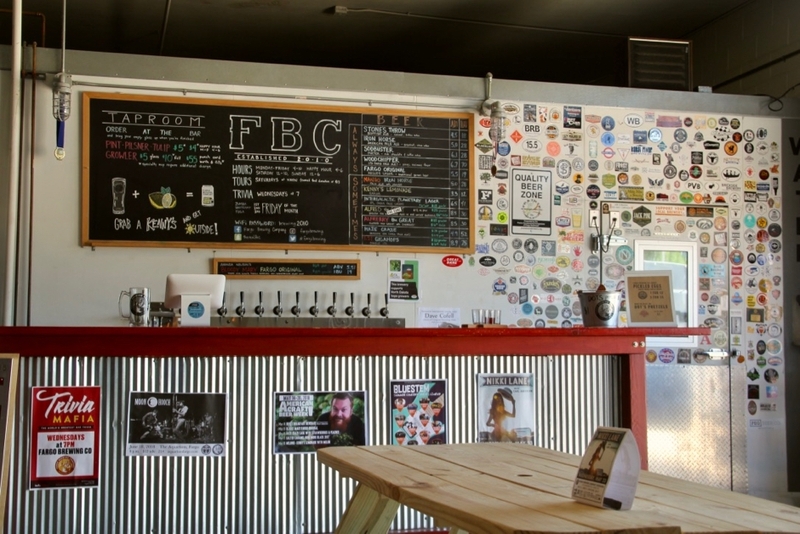 Their taproom is in a corner of the large warehouse that is their production facility. 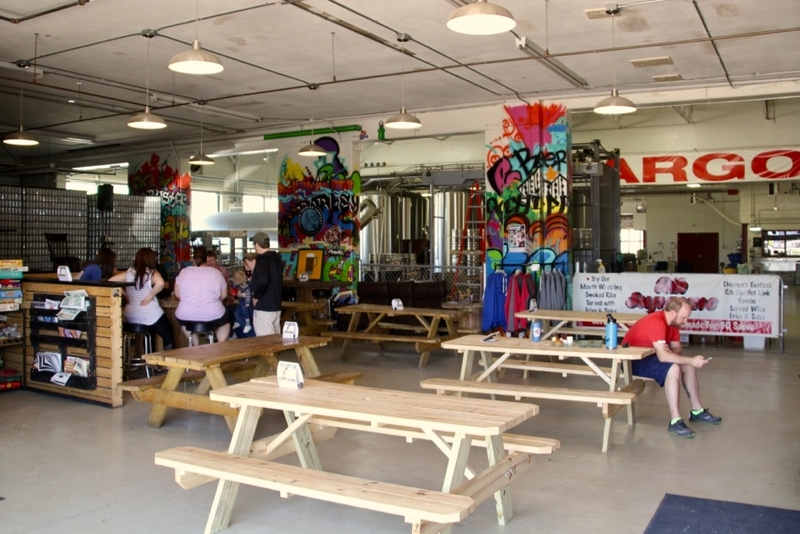 They’ve got a tiny bar in front of their keg cooler, more picnic tables, and some interesting graffiti. 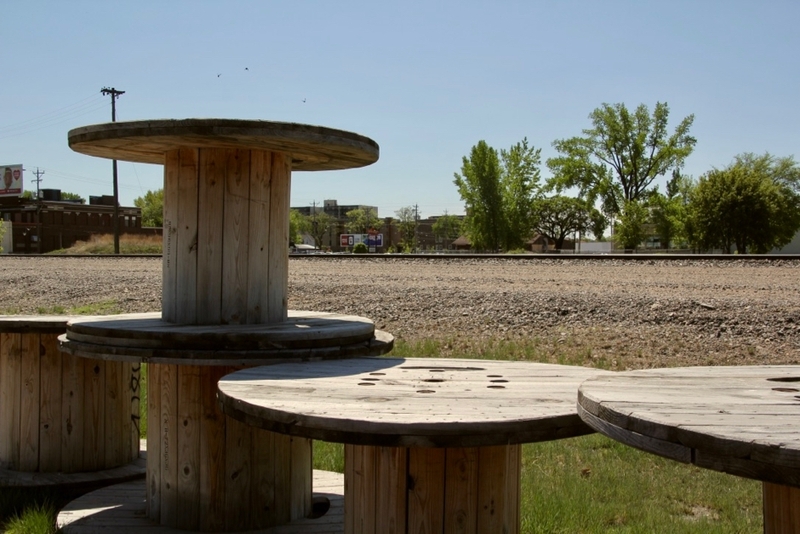 Each picnic table is filled with writing, it seems like they might encourage it. At the back of the seating area you can look into the activity on the floor, of which there was a couple of things going on during our visit. 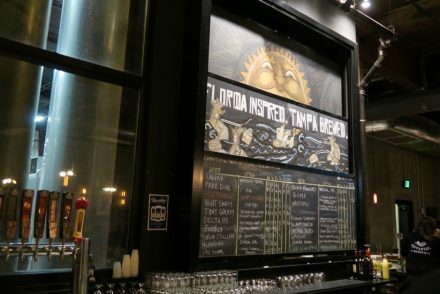 It’s one of those taprooms that has a lot character despite their lack of polish. But no matter what your taproom looks like, you can’t hide behind the beer! The four in my flight were a Fargo Original Helles Lager, Mango Iron Horse Pale Ale, Alferry the Great English Barleywine, and a Haze Craze American IPA. Then I ended with a pint of their Intergalactic Planetary Lager. None of their beers really jumped out at me. 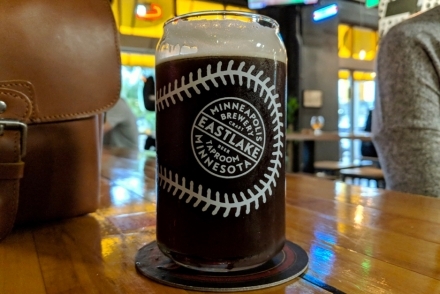 The Fargo Original was the perfect cure for a 4-hour drive: crisp, clean, with a sweet malt backbone. Alferry the Great was a cherry-infused version of their Alfred the Great barleywine. I’m not crazy about cherries in my day to day, but I love it in beer. Alferry had a deep ruby color, with a boozy nose and a cherry tartness that finished with a heavy dose of bourbon. I get in trouble with barleywines so it’s good to stick to the tasters. 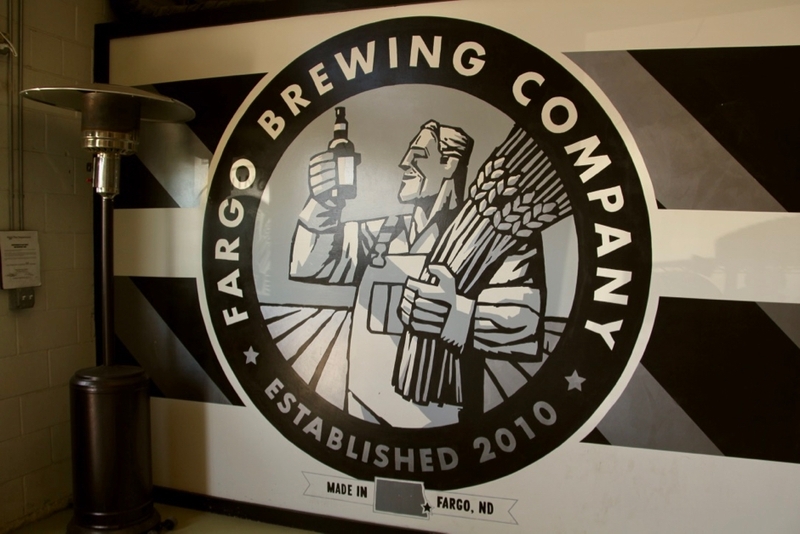 I’m glad we were able to visit Fargo Brewing Company even if we cut the trip short to head to some other destinations. I’d seen their cans in stores and I always enjoyed their clean modern can design. Some would say it’s boring, but I love the consistency, strong colors, and white background that makes the cans stand out of a crowd. If I had to remark on one thing about Fargo Brewing it would be the train. It came by a couple more times while we were there (we didn’t get another horn though), and each time the sound of displaced air and vibrating ground filled me with a renewed vigor. 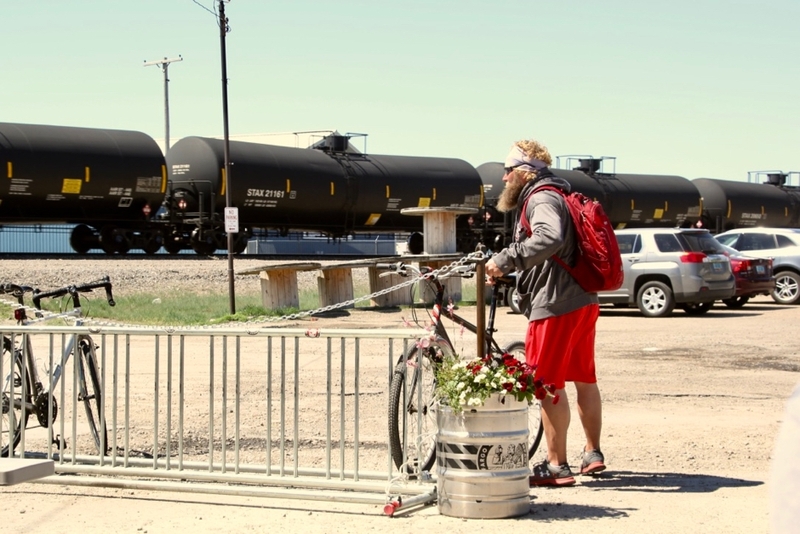 Every brewery needs a train!